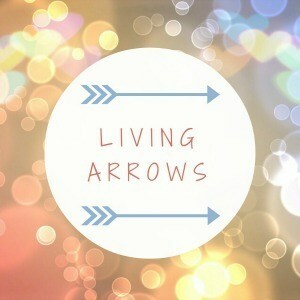 My picture for this week's Living Arrows was taken yesterday. E was supposed to be at nursery but after a few days of having a runny nose and eyes, she woke with a full blown cough and cold and was generally feeling very sorry for herself. Having spent much of the previous night up with T, I wasn't feeling my most patient and throughout the day there was much grumpiness from all. T loves to copy what E does and, as you might imagine, E doesn't always appreciate it. In between playing referee with these two, there was a moment of calm captured below. E had asked to get into her pyjamas and T decided she wanted to do the same - she hates the thought that she might be missing out on something. So after a day of grumbling at each other, I pulled out a couple of activity books, popped Boj on and peace was restored for a short time. Ahh I love the calm restoring properties of tv. 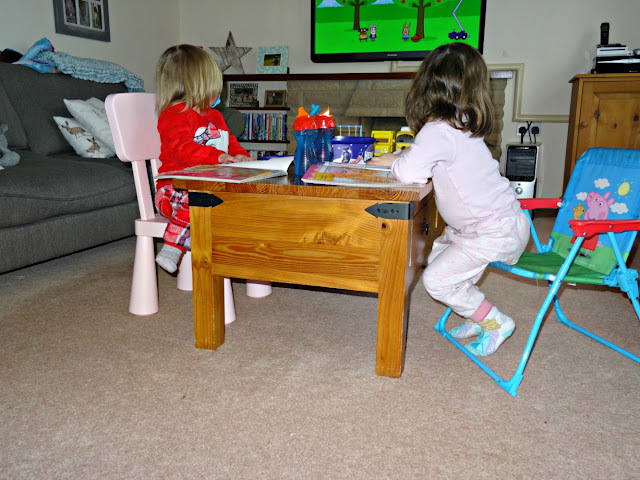 My go to is Peter Rabbit or Peppa pig (as much as I really don't like her the toddler is obsessed). Sometimes you've just got to do whatever it takes to stop the grumbling haven't you? And if they're happy, I'm happy!